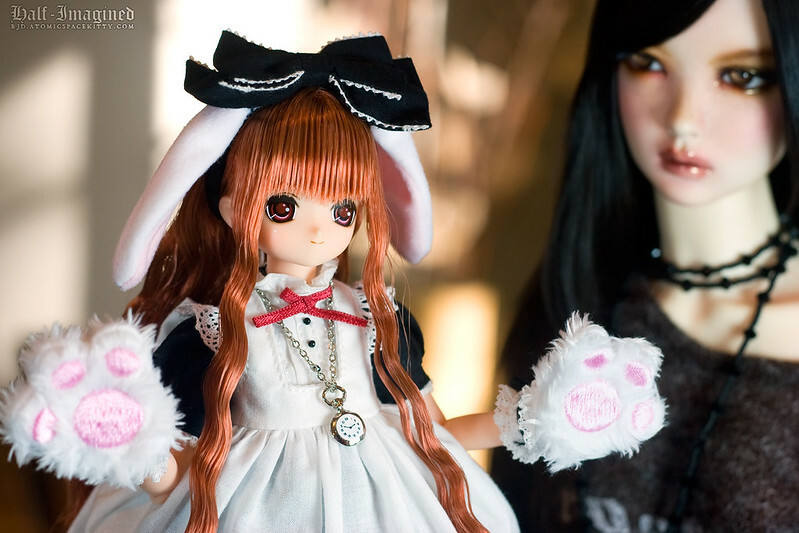 Emily is so happy that her new doll—an Azone 10th Best Selection Tick-Tock Rabbit Himeno (quite a mouthful)—finally arrived. The look of love. We're all familiar with that feeling for a new doll, aren't we? I'm in love with Himeno's eyes. They are unique when compared to the my other Azone girls' eyes. The red pupil is so pretty—it kind of adds to her rabbity-feel. I almost got her too. She has such an adorable face and like you, I find her eyes very interesting. Congrats on her arrival. I really adore her outfit. It looks very similar to Cheshire Aika's outfit but in a different colour. I really love that clock necklace too. Thank you! I think it's neat that there are two versions of her so that you can choose which face you like the best. I usually like the smiling Azones. They make me smile as well. I thought the Cheshire Aika as cute too. Both of their outfits are beautiful. I'm super-happy with Himeno. I think I want her to try to just dress her in fancy/loli outfits. She seems to suit that style really well.